The Assyrians of today are the indigenous Aramaic-speaking descendants of the ancient Assyrian people, one of the earliest civilizations emerging in the Middle East, and have a history spanning over 6750 years. Assyrians are not Arabian, we are not Kurdish, our religion is not Islam. The Assyrians are Christian, with our own unique language, culture and heritage. Although the Assyrian empire ended in 612 B.C., history is replete with recorded details of the continuous presence of the Assyrian people until the present time. Plundering, massacres and destruction of seventy of Urmia's villages in the plains. Please visit the Assyrian Holocaust and Assyrian History Timeline: 1900's sections for eyewitness accounts information. During World War I, the powerful countries of Great Britain, France and Russia met to decide on the Partition of the Ottoman Empire’s territories after the war had ended. In what was called, "The Sykes - Picot Agreement", April 26th - October 23rd, 1916, in which Mosul (Nineveh) was decided to be zoned as a territory under France’s control. 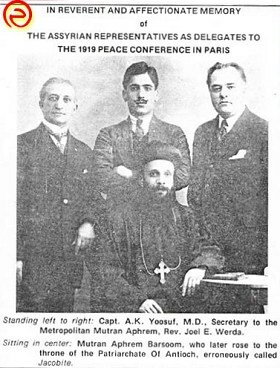 Three Assyrian groups were scheduled to participate in the Peace Conference in Paris, France; Assyrian delegates from the United States, Iraq and Iran. The Assyrian group from Iran arrived first, included S. Ganja, L. George and L. Yacoboff, and since Great Britain feared the presence of a group which she can not control, not having much authority in Iran, the British forced the Assyrian delegate of Iran to leave Paris and not participate. Then the Assyrian delegate from the USA arrived which included: S. Raji, M. Shakour, A. Barsoom, B. Bakous, A. Ablahad, A. K. Yousuf, R. Najeeb, G. Zabouni, S. A. Namiq and Rev. J. E. Werda. Their demands were basically to establish an Assyrian independent territory including northern Bet Nahren beginning from the lower Zab River, Diyar Bakir and extending to the Armenian mountains and under the protection of the super powers. Great Britain and the US delegates denied the petition explaining that the US president F. Wilson is having strong reserves from any plans to divide Turkey. 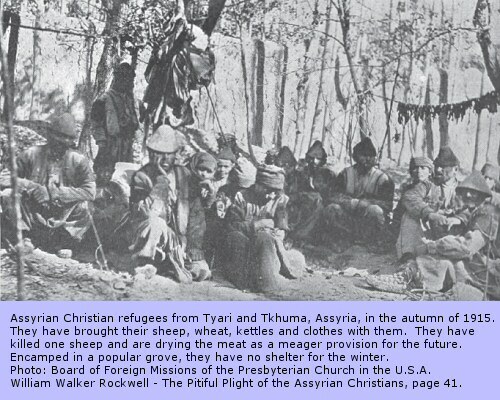 The Assyrians from the USA returned empty handed. The Assyrian delegate from Iraq after too many delays by the British authorities was approved to travel on July 21st, but on one condition, to pass by London, England first. 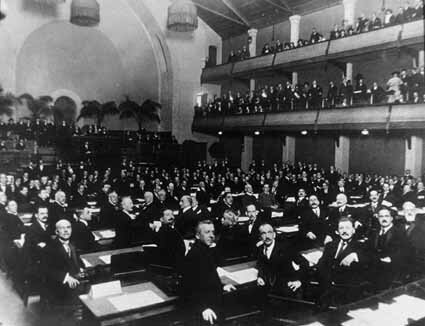 There, Surma Khanim, the head of the delegate was kept in London until the conference of France finished its deliberations. Surma's demands were very realistic which were to allow the Assyrians to return to Hakkarri, basic freedoms, the release of all prisoners and the punishment of the criminals responsible for the atrocities committed against the Assyrians. This treaty, signed on August 10, 1920, put the foundations for the new Turkish frontier post World War I. Assyrians were not permitted by Great Britian to participate in these deliberations under the ground rule that the Assyrians were not an equal power with the rest of the participants. But the Assyrian issue was discussed and the scheme was to contain full safeguards for the protection of the Assyro-Chaldeans and other racial or religious minorities under articles 62, 63, 140, 141, 142, 147, 148, 149, and 150 and as a result of this treaty, Mosul (Nineveh, Assyria) was given to Iraq while France was guaranteed 25% of Mosul's oil production. "... this plan must provide complete guarantees as to the protection of the Assyro-Chaldeans and other ethnic or religious minorities in this area. To this end, a commission made up of British, French, Italian, Persian and Kurdish representatives will visit the area so as to determine what adjustments, if any, should be made to the Turkish frontier wherever it coincides with Persian frontier as laid down in this treaty." The Treaty of Lausanne, signed on July 24, 1923, took place after Turkey requested that the issue of Mosul (Nineveh) needed to be re-examined again. Assyrians once again were not allowed to participate as Great Britian stood in their way, but again they were promised that their rights will be protected, worth mentioning that Agha Petros, General of the Assyrian Army, attended the opening ceremonies. The United States stood beside Great Britian in these deliberations as the latter promised 20% of the oil industry business to be awarded to American companies. Turkey lost its appeal to win Mosul (Nineveh) back based on Great Britian's claims that this region will be saved for the future settlement of the Kurdish and Assyrian people, and no final agreement was reached. "There will be no official restriction on any Turkish citizen’s right to use any language he wishes, whether in private, in commercial dealings, in matter of religion, in print or at a public gathering. Regardless of the existence of an official language, appropriate facilities will be provided for any non-Turkish-speaking citizen of Turkey to use his own language before the court." The Assyrians were told that Britain is fighting their case for them and that there is no need for them to attend. A letter on behalf of the Assyrians and their settlement was written under the direction of Sir Henry Conway Dobbs, the British High Commissioner in Iraq, under "Statement of Proposals for the Settlement of the Assyrian People in Iraq", in that regard. The government of Turkey, claimed that Mosul (Nineveh) is part of Turkey and Fet’hi Beg declared that the Assyrians, who he referred to them as Nestorians, are welcomed to live in their previous lands in Turkey where they will find freedom. Sir Percy Cox, stated that Mosul (Nineveh) belongs to Iraq and that the Christian Assyrians need protection from Turkey. No agreement was reached at the end. Turkey then massed its troops on the border to occupy the Mosul (Nineveh) Province by force. The Assyrian Levy Force of 2000 were sent north to protect Iraq, since the Iraqi army at this time was unfit to undertake such task. The Assyrian force was largely responsible for the annexation of Mosul (Nineveh) to Iraq rather than to Turkey, as an official of the League of Nations stated. Britain requested from the League of Nations to look into the issue of the borders between Iraq and Turkey. And a Frontiers Commission was established to look into the matter on Oct. 21, 1924. The Commission presented its findings and suggested the importance of protecting the Assyrians if they were to return to Turkey, their freedom, reimbursements for all their loses during the Great War and the full authority of the Patriarch, Mar Eshai Shimun, over his people. Recommendations were not approved upon. And it was finally recommended that the issue should be referred to the Permanent Court of International Justice in The Hague, an integral part of the charter of the League of Nations which was later replaced by the International Court of Justice after the birth of the United Nations. Took over the disputed border line issue and inDecember 1925, adopted a resolution which refused the idea of the Assyrians return to Hakkarri and gave that region to Turkey, while giving Mosul (Nineveh) to Iraq and settling on a border line almost matching the same status quo line which was called the Brussel Line and recommended the continuation of the British mandate on Iraq another 25 years to safeguard the Assyrian interests. Treaty between Britain and Turkey was signed settling the issue of the borders and Mosul (Nineveh) province. Hence Britain gained possession of Mosul's (Nineveh) rich oil fields and set out to deny the rights of the Assyrians. In July 1927, Captain Fowraker, a Levy officer who spoke Assyrian fluently, became in charge of the settlement issue. He noticed that Assyrians were scattered all over north of Iraq, in contradiction to the League of Nation’s decision to settle the Assyrians in a “Homogeneous Enclave”. The Assyrians continued to protest about their mistreatment and continued to send letters to the League of Nations which requested a report from both of the governments of Britain and Iraq about the situation. The Permanent Court of International Justice in The Hague, did not accept the reports of Britain and Iraq and requested from both countries to fulfill their obligations towards the Assyrians. Britain dropped the earlier established recommendations by the Mandate Commission and declared that those recommendations should be directed to the Turkish Government and not the Iraqi government, since Hakkarri is the original homeland of the Assyrians and those who escaped have no intentions to return to Turkey. Hence, they should occupy whatever land the Iraqi government has provided for them. 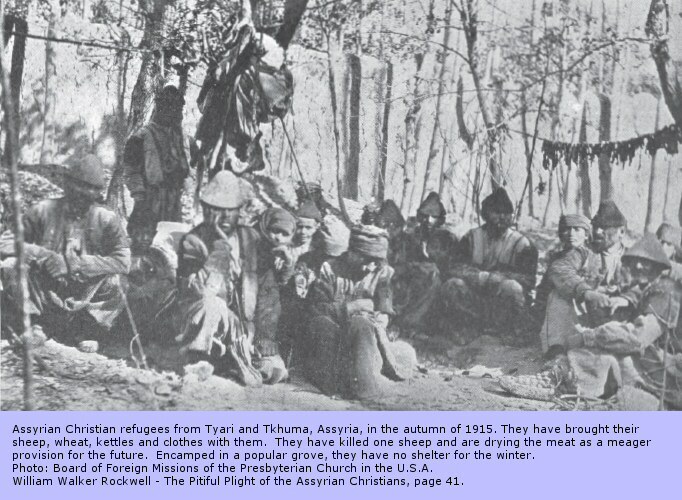 "The Turkish Amnesty Law did not cover the Assyrians, who would not be permitted in any circumstances to enter Turkey; And that any Assyrian who attempted to enter Turkey would be punished." Several treaties were signed and ratified between Britain and Iraq in the next two years in what seemed to be Britain’s preparations to clear the way for Iraq to enter the League of Nations. Three petitions were received by the Mandate Commission stressing the fears of the Assyrians regarding the termination of the Mandate; they were dated in September 1931, October 20, 1931 and October 23, 1931. One of these was rejected by Sir Francis Humphrys on the grounds that it was submitted by Captain Rassam (Hermiz Rassam’s son) who was not qualified to represent the Assyrians even though it was given to him by the Assyrian Patriarch but he, Humphrys, still pledged the ‘moral responsibility’ of Great Britain to the future attitude of the Iraqi government. The Oct. 23, 1931 petition was submitted by His Holiness Mar Eshai Shimun XXIII, in Mosul (Nineveh), asking for permission to allow the Assyrians to leave Iraq before the end of the Mandate since it would be impossible for the Assyrians to live in Iraq. This decision was reached at with the agreement of all the Assyrian leaders and when responses to this petition were delayed, the Assyrians decided to take action and planned for a general ‘cessation of service’ by all the Assyrian Levies. The Mandate Commission reviewed the Assyrian petition and was still not satisfied with Britain and Iraq’s assurances of protection of Minorities. Worth mentioning here that Sir Humphrys was accused by his own fellow British officials to fabricate lies in regards to the Iraqi government’s sentiments about the Assyrians. In partial compliance with requests of the petition, the Iraqi government set up a further land-finding committee. It discovered but little land both cultivable and available. In fact, they found malaria-ridden, swampy lands, and in their usual obnoxious style, recommended expenditure on an irrigation scheme to produce more. Hundreds upon hundreds of Assyrians died with malaria in those lands. Accordingly, Iraq was accepted in the League of Nations on October 3, 1932. The Assyrian national question was taken to Geneva by the Assyrian Patriarch, His Holiness Mar Eshai Shimun XXIII again when he addressed the Permanent Mandate Commission meeting and urged the Council to fulfill its obligations toward the Assyrian Nation. The League yet again granted the Assyrians their rights of homogenous community in Iraq with a local autonomy. This was discussed again on December 15th, 1932. “The Nestorian Patriarch Mar Eshai Shimun, Patriarch of the Assyrians, who has been under detention for some time for having declined to sign a declaration of loyalty to King Faisal and agree not to thwart the scheme of the League of Nations for the settlement of the Assyrians, was deported by the order of the government today (August 18, 1933) and deprived of Iraqi nationality. At the village of Kouba near Bab Chikchik, four Assyrians were attacked. Two were killed and two were wounded. Eight Assyrian soldiers were killed, during the fight with the Iraqi army on the Syrian-Iraqi borders. The Iraqi army returned to Mosul (Nineveh) and right through its way began a systematic massacre. At the same time the Qaimaqam of Zakho, Ahmed al-Dibuni tortured 46 Assyrians to death. 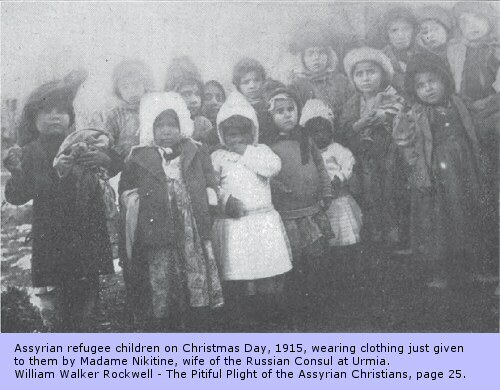 The Assyrian population of the village of Simel was indiscriminately massacred; men women, and children alike. In one room alone, 81 Assyrians from Baz were barbarously massacred. Priests were tortured and their bodies mutilated. Girls were raped and women violated and made to march naked before the Arab army commanders. Holy books were used as fuel for burning girls. Children were run over by military cars. Pregnant women were bayonetted. Children were flung in the air and pierced on to the points of bayonets. In Dohuk 600 Assyrians were killed." 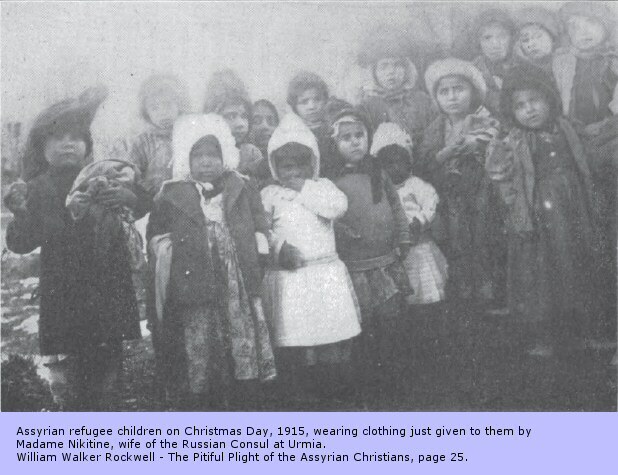 It is estimated that 3,000 Assyrians were massacred during the August of 1933. After the Simele Genocide, the Council of the League of Nations was absolutely sure that the Assyrian issue was still an unsolved problem. The Assyrian Patriarch requested the League to form an Assyrian and Kurdish enclave in the north of the province of Mosul (Nineveh) under a special administration. The Patriarch reminded the Council about such plan which was originally suggested by Lord Curzon, the British Foreign Minister, on Dec. 17, 1919. In Iraq, Rashid Ali Al-Gailani, the Iraqi Prime Minister, announced that the Assyrians should find a new home outside Iraq and promised that the Iraqi government is willing to make very generous contributions to cover any expenses of such settlement. On Oct. 13, 1933, the League of Nations appointed a committee of six of its members to look into this possibility. On Oct. 24, the Assyrians submitted another petition by Yousuf Malik, an Assyrian Nationalist from Iraq who was exiled to Lebanon and who moved between Cypress, Beirut and Damascus exposing what was going on inside Iraq and the British games. This petition gives details to a lot of cases of oppression against the Assyrians in Iraq and details on hardships from government officials and the facts about the Simele Genocide. From October 1933 to June of 1935 the committee of six looked into many options, they covered Brazil, British Guiana, Niger (in Africa) and they all failed. A further suggestion that the British Red Cross might send a relief party to Mosul (Nineveh) was also objected to, apparently on the grounds that this would discourage the activities of the Iraqi Crescent, which has not carried out any relief work among the Assyrians. In Sept. 1935, the plan of settling of some of the Assyrians in the Khabour / Ghab areas in Syria was approved. History shows that the plan was never followed up with and it had failed. Things did not change for the Assyrians in Iraq until the outbreak of World War II, when the Iraqis revolted under Rashid Ali Al-Gailani who sided himself with Germany and wanted to force the British out of Iraq completely. The faith of the British existence in Iraq hanged in the hands of the 1,500 Assyrian Levis ability to hold the British Air Force Base in Habbaniya against the Rebels of over 60,000 Arab tribesmen and regular troops who surrounded the base. The Battle of Habbaniya is well described in the book, "The Golden Carpet" by Somerset De Chair, a British intelligence officer served in Iraq during W.W.II. The Assyrians have saved Iraq from falling in Germany’s hands. The United Nations was created in San Francisco, California USA (replacing the League of Nations). The Assyrian Patriarch, Mar Eshai Shimun XXIII, was there to present the Assyrian National Petition to the new world body of peace and was accompanied by two members of the Assyrian National Federation. In this petition the Assyrian tragedy was explained from World War I until the end of World War II. Several petitions from the Patriarch in 1945 and 1946 were sent to the Secretary General of the United Nations to look into the Assyrian National Question. A letter from the UN General Secretary # 1100-1-4/MEJ dated Oct. 7, 1946 was received by Mar Shimun stating that he has referred the Patriarch’s petition to the Commission on Human Rights. March 13, 1947 - Petition to the UN General Secretary about the Assyrian Massacres in Iran. A petition concerning the Assyrian Massacres in Iran was filed again by Mar Eshai Shimun XXIII, Patriarch of the Assyrian Church of the East. He struggled for over a half century at the League of Nations, then the United Nations, all in vain. The Allies were embarrassed to consider that such a small nation-church had been their “Smallest Ally”. "Shlomo, you make us very proud, we are with you brothers and sisters and we will meet in Beth-Nahren, Assyria!!!"